I’ve written before about an annual survey conducted by the Gallup folks. 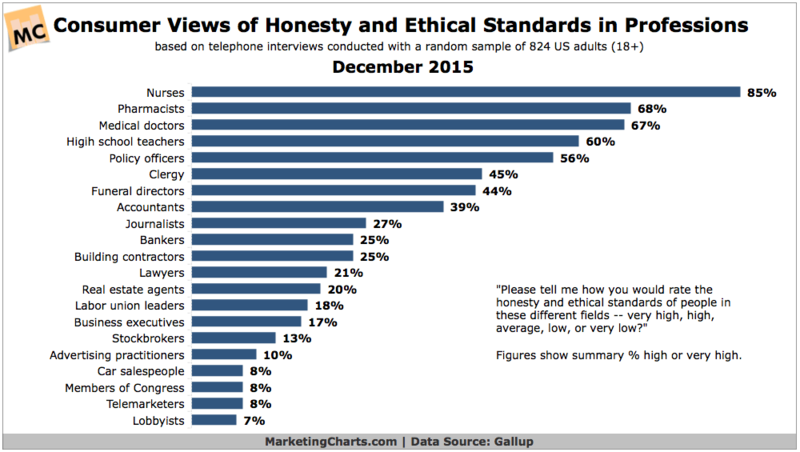 They ask people to “tell me how you would rate the honesty and ethical standards of people in these different fields – very high, high, average, low, or very low.” I’m sure it’s not shocking to you that nurses top the chart with respect to the percentage of people who respond their ethics and honesty are high or very high. It might, however, be a shock to you where businesspeople – and ad people in particular – fall on the scale. Just 1 in 10 US adults rates the honesty and ethical standards of advertising practitioners as high or very high. While ad people did manage to surpass car salespeople (8% rating as having high or very high honesty and ethical standards), members of Congress (8%), telemarketers (8%) and lobbyists (7%), it’s still not very good. In fact, it’s sad. But is it a surprise? Unfortunately, I don’t think so. Not when we can read members of the ad community advocating disguising ads as content. Not when we knowingly allow robots to access our sites so it appears that we’re serving up more ads to people than we really are. Not when influencers talk about something they like without disclosing that they’ve been paid to mention the product. It’s not just the ad business. Business executives overall were well thought of by only 17% of the respondents. That falls behind lawyers (21%) and labor union leaders (18%). Again, not a shock, given the almost daily news reports of unsafe products (hoverboards, air bags to mention just two) that the manufacturers knew had a problem but which were sold anyway. 2016 is only a few weeks old. Maybe instead of resolving to lose weight or to quit smoking, those of us in business need to resolve to up our ethics and honesty? Maybe we should be focusing on doing right for our customers and not for our shareholders? What are your thoughts?